A fine French violin bow by Prosper Colas 1900. 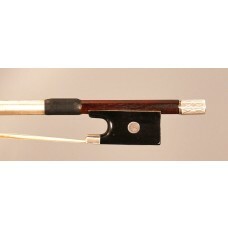 A beautiful French silver mounted violin bow by Prosper Colas - made around 1890- certified by J.F. Raffin in Paris. Prosper Colas (1842 - 1919) was trained in Mirecourt and worked for J.B. Vuillaume in Paris. Beautiful medium brown stick, round shaped. A beautiful elegant shaped head. The length of the stick is around 72,7 cm (4/4 size), and the perfect weight of the bow is ca. 60 g.
It comes with a new hair, new winding, ready to play. Please read the complete description in the certificate and bid with 100 % confidence. International bank transfer or Paypal (only from a verified Ebay members with a confirmed address) will be accepted within 5 days after auction completed. 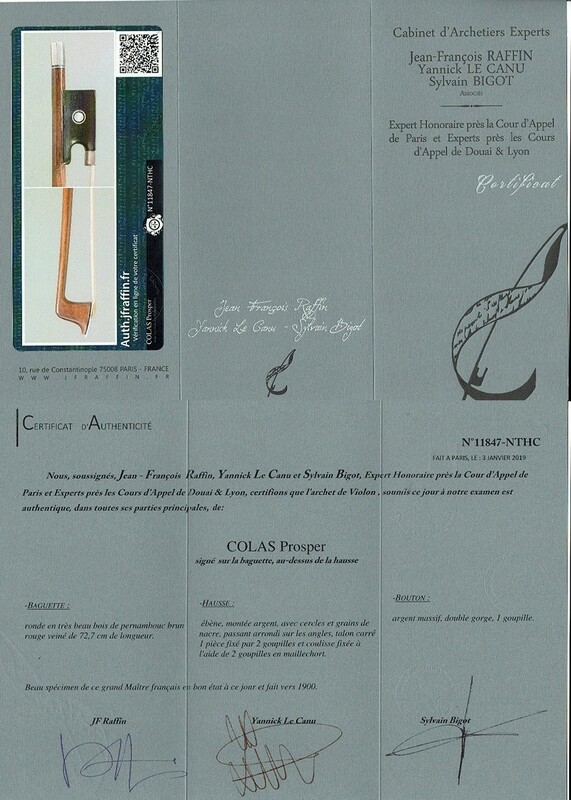 François "Prosper" Colas (1842–1919) was a French archetier / bow maker based in Mirecourt, France. Born in Goincourt (Meurthe et Moselle) in 1842, he apprenticed locally, and was influenced by the late Dominique Peccatte school (in his early period). Prosper Colas's work is similar to that of François Bazin, Charles Claude Husson, and Pierre Cuniot. Around 1871, he came to Paris where he likely met Jean-Baptiste Vuillaume and worked for him. The first bows bearing his brand can be dated to this period and reflect Vuillaume's influence (with the "Vuillaume style frogs"). Prosper Colas worked for a varied number of makers and produced a huge quantity of bows. His best production was from the turn of the century (early 20th century). His lower tier production is stamped “P.C.”. One can also find instruments bearing Prosper Colas's label as he sold mail order instruments made by the primary Mirecourt workshops of his time: Jérôme Thibouville-Lamy and Marc Laberte.